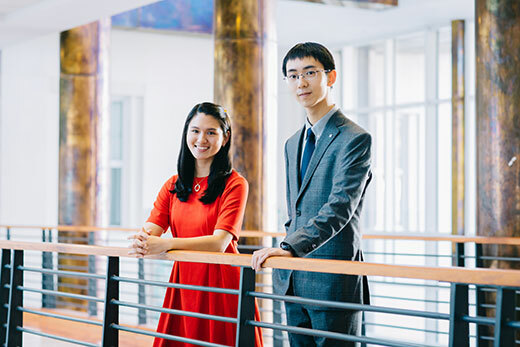 Emory College senior Elliot Shuwei Ji, Emory/Georgia Tech dual degree engineering student Veronica Chua and recent alumna Zhongyuan “Echo” Zeng have been selected as Schwarzman Scholars for the Class of 2020, for graduate study in China next year. They are Emory’s fifth Schwarzman Scholars in the program’s four years and among 147 remarkable students from across the globe selected from more than 2,800 applicants. Enrolling in August 2019, they will earn master’s degrees from Tsinghua University while getting exposure to Chinese culture, business networks and leaders. “The selection of three students for the Schwarzman Scholars program is a recognition of Emory’s success in preparing students for global careers,” says Joanne Brzinski, senior associate dean for undergraduate education. Each scholar will earn a master’s degree in global affairs, with a focus in one of three disciplines: economics and business, international studies, and public policy. Combined with the cultural immersion, the program is designed to bridge academic and professional worlds to educate students about leadership and China’s expanding global role. Ji is a Dean’s Achievement Scholar who will earn his bachelor’s degree in political science with a concentration in international relations in the spring, after just three years of study. Going to Tsinghua University, one of China’s leading universities, will be a homecoming of sorts. He was born in Beijing, moving with his family to New Jersey when he was 13. Between high school and college, Ji worked at the 5th World Peace Forum at Tsinghua University, where he helped coordinate the arrival of speakers, including a former Japanese prime minister and China’s vice premier. He also served as an interpreter for dignitaries who included the former foreign minister of Bangladesh and Australia during the forum event. Ji has conducted research in those arenas through an internship at the John L. Thornton China Center at the Brookings Institution. He has also worked as a research assistant at the Carter Center and as a fellow at Emory’s Center for Law and Social Science. He credits political science professors Jennifer Gandhi and Eric Reinhardt, among other mentors, with providing guidance and support for his academic training and independent research project on China. The Schwarzman Scholarship will give him a chance to further expand his research on his way to a graduate program in political science or law. It also provides a practical understanding of his work, with a chance to conduct field research in China. Chua is a Dean’s Achievement Scholar who will graduate with Phi Beta Kappa distinction in December from a five-year dual degree program between Emory and the Georgia Institute of Technology. On campus, she served as a mentor for the Multicultural Outreach and Resources at Emory (MORE) program. She also is the founder and author of Emory’s first-ever guide for the dual degree program, which has been accessed and viewed by hundreds of students across the globe. Chua plans to harness her degree in mathematics and economics from Emory and her degree in industrial and systems engineering from Georgia Tech to develop a cross-border shipping model for small businesses. She specifically aims to establish partnerships between American and Chinese logistics providers, so delivery operations can be executed in a more time- and cost-effective manner. Her mission is driven by her professional experiences, given Chua’s internships with Nestlé USA in supply chain and procurement, The Home Depot in e-commerce and Roark Capital Group in private equity. It’s also personal. Her parents moved from the Philippines to set up a medical practice in Miami. Her father is a cardiologist, while her mother is the accountant and business manager. Following her time as a Schwarzman Scholar, Chua will join McKinsey & Company as a business analyst in their operations practice. A Beijing native, Zeng was starting to notice the social fragmentation in her hometown right before she arrived at Emory’s Oxford College. Later, serving as a student volunteer at Arrendale State Prison, where she helped conduct an English memoir class with female inmates, gave her an up-close look at problems that institutional discrimination and housing segregation could create. Her concerns came together when, studying international business and marketing at Goizueta Business School, she took an urban planning seminar while studying abroad at the ESSEC Business School in Paris. Zeng graduated in 2017 with a business degree from Goizueta and a double major in political science. She will graduate from the University of Pennsylvania this spring with a master’s degree in city planning – just in time to apply her knowledge as a Schwarzman Scholar. Her focus will be on public housing provisions, the scarce low-rent housing for low- and middle-income residents, in China’s first-tier cities, and on the renewal of “urban villages,” the substandard communities in cities where migrant workers live. 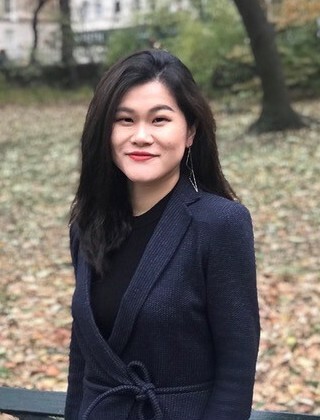 Zeng shadowed leaders in a Beijing urban village last year, providing her with the hands-on experience she hopes to supplement with her Schwarzman study. Her plan is to then remain in China, using her training and experience in public service, working to mitigate urbanization struggles.